I frequently stay in Paris for several weeks. Hotels are too expensive for long-term stays plus the added necessity to eat daily in restaurants drains my budget AND gets old quickly. Often, after a long day, don’t we all just want to stay in….especially on those rainy or cold evenings. After many years of enduring frequent hotel stays, I was rescued by discovering VRBO (Vacation Rental By Owner) for my Paris short-term apartment rentals. Yes, Airbnb has become a household word….but Paris VRBO delivered all of my must-haves: affordable convenient locations, speedy Wi-Fi for Skype and Internet, apartments are always as they appear on their site, staff speaks English and always available to help, never surprise cancellations, and my deposit is refunded within 2 days. I have spent weeks in all of the pictured apartments and have always been happy. They are my home away from home! 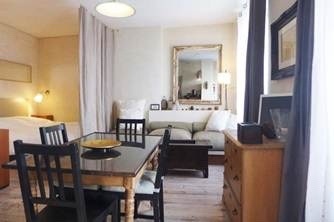 I love my small private outdoor terrace at this Montmartre studio. I even dine on the terrace wearing a sweater…and in warm weather, totally the place to find me! This Montmartre one bedroom EVEN has a pull down Murphy bed in the living room and the modern shower rivals 4-star hotels! For those times when I am looking for extra economy, this studio is the answer. The sofa opens to a full comfortable bed and it is my GO TO apartment for cost and my favorite location! Booking an apartment for a week is the best value and can keep the cost as low as $60-$80 per night. This entry was posted in BUDGET TRAVEL, PARIS and tagged BUDGET TRAVEL, Paris, WHERE TO SLEEP on February 22, 2015 by passportandcuriosity. What a great eye-opener. Certainly a consideration for future trips. The revealing photos are appreciated.